War asks for sacrifices. It seems to be the way the game is played. Some are asked to give their lives, others their childrens’ lives. Where you live, how you live, with whom you live changes in war. For my grandparents,Elzie and Vera Chenoweth, many of these things changed for them during World War II. Grandpa and Grandma lived on the family farm in Fulton county, Illinois as had Grandpa’s father, grandfather and great grandfather before him. The Chenoweth family had moved to Illinois in the mid 1850’s and began farming near Table Grove, Illinois. Not quite 100 years later, that farm house, barns and fields were under attack. No Nazi German or Hirohito’s Japanese had invaded western Illinois. It was the United States federal government who would take the farm from my grandparents. William and Martha Jones Chenoweth homestead near Table Grove, Illinois. Circa 1880s. 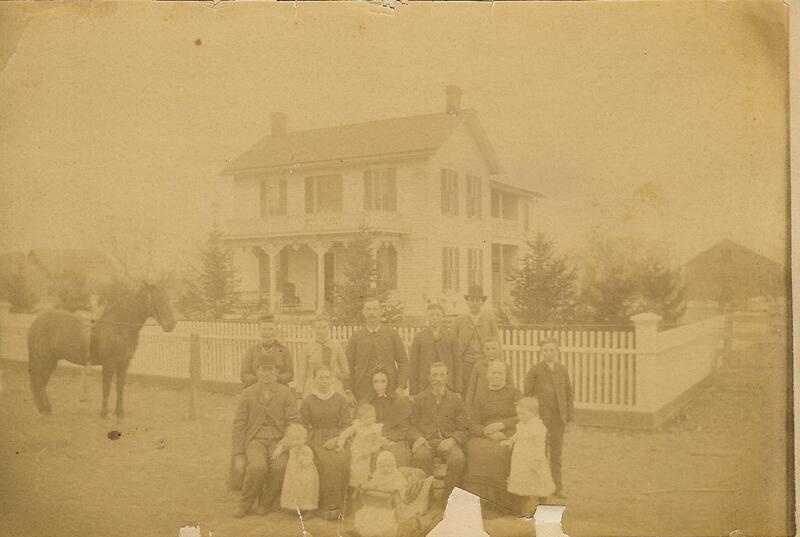 Pictured are their children in front of the home. This house and farm would be torn down in the 1940s to make way for the US Army Camp Ellis. In 1942, the government was looking at land in order to build a military camp. Western Illinois offered just the spot. Camp Ellis was soon on the map to be constructed from the farmland, however, the problem was buying up of the land and getting the people to move somewhere else. Grandpa and Grandma were told what the price would be they would be paid for their land. They held an auction of their equipment. While they were trying to quickly move out, the government came in, tearing down the barn almost over their heads. The farm house came down. Five generations of my family were born in that house. Fields were tore up and shooting ranges replaced timber ravines. Things changed swiftly. My grandparents moved to a nearby community and bought a farm to begin farming again. The young man who worked for them on the farm had reported to military service and later died just a few days after D Day. The family that had always lived within a mile or two of each other were now scattered to the four winds. Things changed. My grandparents changed in many ways, yet they never were bitter about losing the farm to the war effort. They felt others had sacrificed more. Their sacrifice was close to home. It WAS their home. Postscript: In the mid 1950’s, Camp Ellis was abandoned by the federal government and families had the opportunity to repurchase land originally owned by them. My dad still owns an original 40 acres from one of these farms. Sticking together and family. Those were the most important things to her. Sarah Alice Salmans (1866-1957), daughter of Levi Franklin Salmans (1841-1912) and Rosa Jane Brown (1843-1888), served as the oldest child in a family of five girls and five boys. Good deeds were likely plentiful when you had to help raise the youngsters. She had moved from her birthplace in Ohio with her father, pregnant mother and little sister to Illinois in 1870. Once Levi Salmans saw the smoke from the neighbor’s fire, the itch to wander began working on him. Before they moved again to Kansas in 1885, the rest of the children had been born. At age 19, Sarah, or Allie as the family called her, found a job for top wages of $3.00 a week and bought what she called “fussy” clothes with her own money – a black skirt and white shirtwaist. A straw hat with three yellow plumes served as the most important piece she had. When indians came through, she hid the hat so it wouldn’t be taken. Her youngest sibling, a baby boy, died soon after childbirth in December of 1887. Her mother’s health began failing soon after and Rosa Jane wouldn’t see Christmas 1888. A severe crop failure in 1888 and now the death of her mother blew an ill wind through their homestead on the “Stroud Quarter Section”. Sacrifices were going to have to be made and Allie stepped up to begin her latest good deed. Her sister, Mary Margaret, was 20 and Belle was 18 at the time of their mother’s death. Mary Margaret married Wes Kabler soon after to take another mouth from the table. Belle took in laundry and baking for the neighborhood bachelors and was married within another year. Allie, however, pledged to her father she would stay and help raise the other siblings, ages 4 to 14, until they were grown. The fortitude of this prairie woman, whose commitment to her family jeopardized her own happiness, was immeasurable. 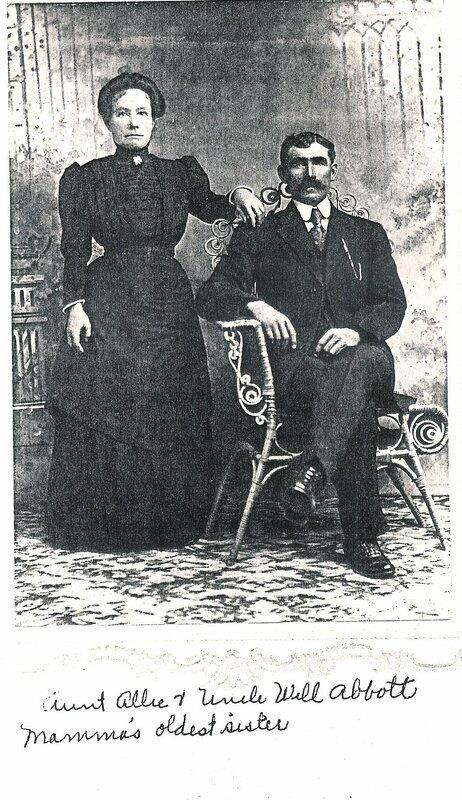 Aunt Allie and Uncle Will never had children of their own, but Allie’s siblings provided many, many Salmans nieces and nephews on the prairie. 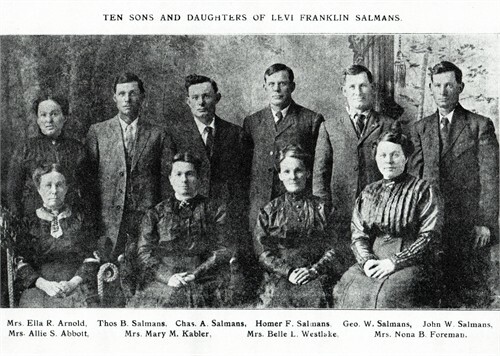 The family prospered and at one time, a large part of Hodgeman County, Kansas was owned by a descendant of Levi Franklin and Rosa Jane Brown Salmans. Commitment to family and love of family carried through in Allie’s good deed. 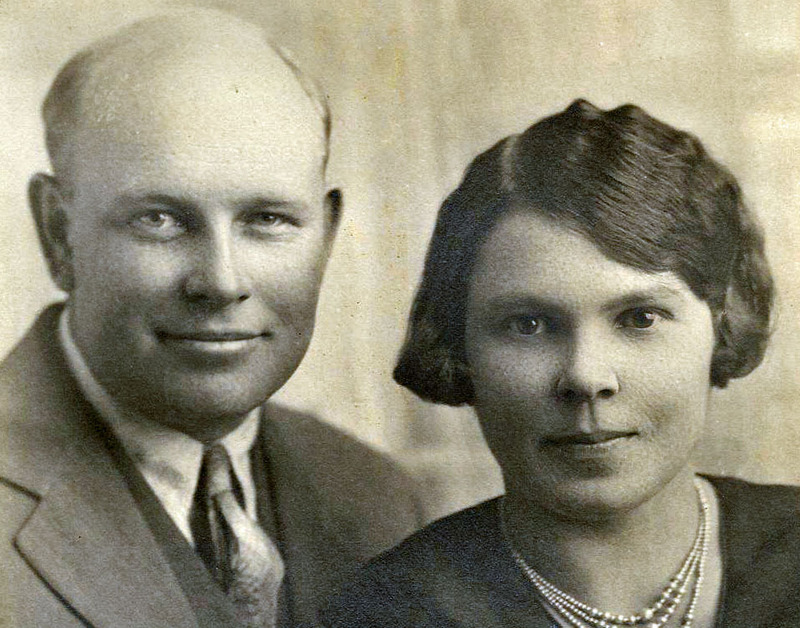 Uncle Will lived another 19 years, but Aunt Allie lived near Jetmore, Kansas until her death in April of 1957 – a true daughter of a prairie pioneer. “Objects in this mirror are closer than they appear.” This would have been a fair statement to have been attached to the photo my mom found in Grandma’s things. Mom and her only sibling, her brother Jerry, had the task most children do of cleaning out the family home in preparation for a sale to settle the estate. There were photos…lots of photos and none filled with very much information, save a few. “August and Theresa Yess” is what the handwriting said on the back of the yellowed image. 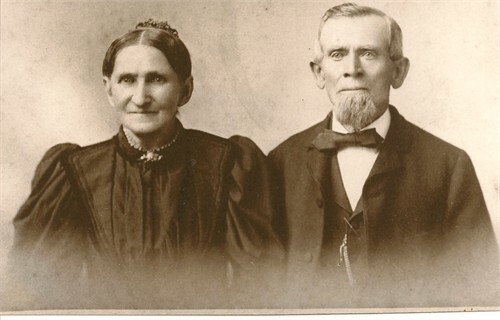 August and Theresa Yess – my 2nd great grandfather and great grandmother had kind smiles, wrinkles from a lifetime of adventures living and mystery behind them. The first mystery was that name, “Yess“. The whole family pretty much knew that wasn’t the correct name. August had immigrated from Germany according to family tales and we’d never met any other “Yess” family in the United States that was related to us that weren’t of direct lineage from August and Teresa. He’d married Teresa in Peoria county, Illinois in the 1850’s, bug what was THAT name? Mystery #2: Why did he immigrate from what was to become Germany? Was it the lure of family or friends who had previously come to Peoria, IL? Was it some other decision that caused the journey? Was he perhaps the second son, one who was required a lifetime of military service back in the mid 1800’s? Mystery #3: Where were they buried? Somehow we had lost them? Few clues were in the papers to indicate where their mortal remains were. Maybe there was more information on the tombstones that would help us to put “clothes on their tombstones” as my Mom puts it. Mystery #4: What happened to their daughter, Amanda? She was fourth out of six children. In some papers it appears she was married to a mysterious Mr. Bontz. In other papers, I found her committed to a mental hospital in Bartonville, IL. What was her story? These people seemed closer than they really appeared because it has taken many years to unravel the stitches in the fabric of their lives. Family stories, genealogical study, tramping around in cemeteries, and talking, YES TALKING to my ancestors has helped to bring them closer. As for Mystery #1, our best guess and study of documents seem to point to August’s last name as being Gess. It would be an easy error made by some English-speaking form filler. Couldn’t understand the Bavarian? Well, it sounded like he was saying Yes and it would be too confusing to spell it “Yes”, so add another S and be done with it. Mystery #2 was not as easy to solve. Asking fellow researchers and studying more about church documents from the area that would become Germany will eventually solve the why of the immigration. Most likely that lifetime military service caused him to take a ship to the United States. As to Mystery #3, I had finally narrowed down a very large cemetery in Peoria, IL where August and Teresa were buried. I stopped by one spring day when I was in town for a meeting….little time to spare in a true search for their tombstones. I had some help in pointing me in the general direction and as time continued to tick down, I finally said out loud to them, “If you want me to find you, I’m going to need some help.” Lo and behold, a beam of spring sunshine came down to light a gravestone over near the trees in the ravine. I chuckled to myself thinking, “Oh sure…yeah, right,…I BET that’s their stone.” And as I walked over toward it, there was YESS on the canopy of the stone with “August Yess – Born: Jan. 24, 1829 Died: Oct. 6, 1905″ “Theresa his wife, Born: Apr. 23, 1824 Died: Mar. 1, 1910” on it. All life’s mysteries shouldn’t be easily solved. The journey of our lives is piecing together what happened to our ancestors, sharing their stories, admiring their tenacity and bravery. Sometimes the people appear much closer to us than they actually are.